The Bear Killaz will have to wait for warmer days. This day started off right with a little office work, packed the truck and took my wife to lunch before I hit the road for the airport located two hours away. Unfortunately, I hit some construction and missed my flight! Fortunately I have a great travel agent who got me on the next flight out, and I was on my way to Seattle to catch the plane to Anchorage, Alaska! Completely exhausted, I made it to the Millennium Hotel at 3 a.m. and checked into my room. The Millennium is the best, located close to the airport, loaded with Alaskan big game taxidermy, and the people are always friendly! I hit the bed and was snoring in minutes, but my 7 a.m. wake-up call came and I was off to breakfast with cameramen, guides, and pilots! This was going to be a busy day … first off to see Bob at Barney’s Sport Chalet to pick up a Brooks Range Jacket, a Bomb Shelter tent, and some other gear we needed while celebrating his 50th year in business. This is a must-stop for everyone coming to Alaska! Next we ran to the Anchorage Satellite Phone store to pick up my Iridium Phone to compliment my DeLorme inReach units for complete communications from the back country. Scott Carr (SOA client) arrives and joins our group! He is to be featured this week on film. We were going to try and fly to the cabin and base of operations, but the low clouds and snow prevented that flight, so we decided to drive up to Flat Top and get a view of the valley and Anchorage you can only see from up there! Back to the Millennium, double-checked my gear, a team dinner and finally a full night’s sleep! Sleep in! 8 a.m. with 10 hours of sleep, I am ready for the day … now hurry up and wait. And wait, and wait … finally at 2:30 p.m. we get the call and load up the plane. Regal Air is flying Dan Lee, my cameraman, guide Jeremy Ruesink and me with a “load” of camera gear into camp in a 206 on wheel skis, and second cameraman Ian Majszak and Scott Carr each jump into a super cub … all three planes are off the ground by 3:30 p.m. and on their way to base camp. 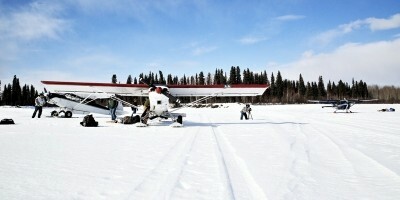 About an hour later we are on the ground and packing gear on snow mobiles for a ride up to the cabin. It’s a cool two-story cabin along a river with a great view of the mountains. We can glass for bears right from the front window! We get everything packed in and settled, we start preparing for the hunt that begins the next morning. Perfect blue sky but damn cold -- daytime high at the cabin is 19 degrees. The planes fly but tell us that it was between 0 and 5 degrees at 1,500-2,500 feet in elevation. No bears are coming out in that cold, but the sunshine is a good sign! We set up targets and check the zeros on all of the rifles. Scott decides to hunt with the Bergara .300 Win Mag topped with the Eliminator laser scope and loaded with 180-grain Corbon T-DPX ammo after he shoots a great group at 215 yards across the frozen river! The hurry up and wait theme now begins … we need warmer weather to get the bears out of their dens. Another spectacular day, we rode out 6 miles to glass Yenlo Mountain … no bears, no tracks, but spectacular scenery and a fun snowmobile ride. I am impressed with the Ski Doo sleds; they cut powder good and have a lot of power. I like snowmobiling, and these are good sleds! Check the temp in the afternoon back at base camp, 25 degrees. Pilots report seeing no bears and temps at 1,500-2,500 feet where the bears are denning is still below 10 degrees. We need warmer weather!! !